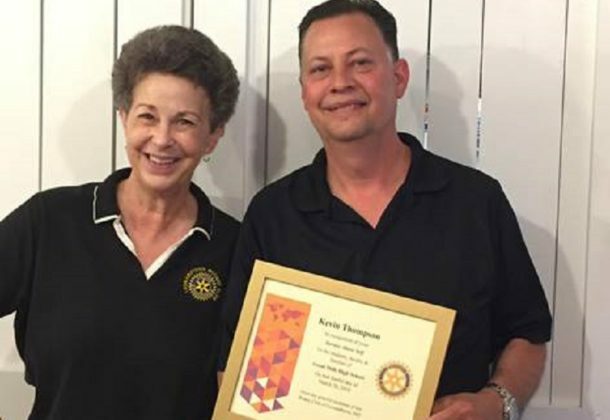 Kevin Thompson, the owner of a Leonardtown restaurant, has been recognized for his meritorious Service Above Self by the Leonardtown Rotary Club. Service Above Self is the principal motto of Rotary because it best conveys the philosophy of unselfish volunteer service. Mr. Thompson’s actions on the day of the shooting at Great Mills High School typify this motto. On March 20, a gunman opened fire at Great Mills High School killing one student and wounding another before killing himself. In the face of this tragedy, Mr. Thompson acted. Knowing that the students and faculty evacuated from the school would be reunited with family at the Forrest Technology Center in Leonardtown, Mr. Thompson closed Kevin’s Corner Kafe, his popular seafood restaurant, to concentrate on making lunches. He and his staff gave away 1,300 lunches to the students, staff, first responders, and family members assembled at the Forrest Center that day. Mr. Thompson was surprised with a certificate and Service Above Self coin by Leonardtown Rotary members who converged on Kevin’s Corner Kafe for a dinner to honor Mr. Thompson. The certificate, now proudly displayed in his restaurant, reads: In recognition of your Service Above Self to the students, faculty & families of Great Mills High School on that fateful day of March 20, 2018 from the grateful members of the Rotary Club of Leonardtown, MD. The Leonardtown Rotary Club is open to anyone who lives, works or plays in St. Mary’s County. The club meets weekly on Thursday mornings at MedStar St. Mary’s Hospital. To learn more about the club, contact Lisa Blackwell, membership chairman, at 614-707-3866.